Lipstick or lipgloss? That seems to be the question on, well, every woman's lips these days. Do you prefer a matte, creamy formula? Or one that's lighter, shinier, glossier? 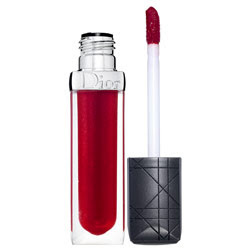 Luckily, Dior has heard the calling and created a new formula that's completely revolutionary -- a lipstick and a lipgloss in one! Creme de Gloss has the feel of a rich, creamy lipstick in the body of a shimmery, shiny gloss -- so your lips don't feel thick or sticky but completely luscious and soft. And with eight shades to choose from, there's bound to be one for everyone, whether you prefer a deep, sultry pucker or a barely-there pout. Pretty pinks such as Creamy Almond and Creamy Gold, ravishing reds like Rouge Nectar and beautiful browns like Beige Elixir and Creamy Chestnut abound.